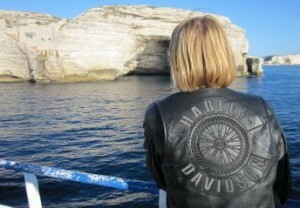 The content of this site is provided and copywright by Clutch Harley Tours ! We’ll start our tour riding to Bolonia, a city famous for its cuisine (la cucina Bolognese), and one of the most beautifully maintained medieval cities of Italy and no journey to Bolonia could be made without a guided tour of the famous Ducati factory and museum. After lunch its a delightful ride over the wooded green Apennian mountains, passing through villages unchanged since the Second World War, before traveling on to the famous city of Tuscany, Florence. Florence, was the center of Italian Renaissance, rising to economic and cultural heights under the powerful noble Medici family in the 15th and 16th centuries. Six hundred years of extraordinary artistic activity can be seen throughout the city. The 13th century Cathedral Santa Maria del Fiore, with its huge dome, an engineering feat in its day, and if limbs allow, you can climb, the 464 steps. The Church of Santa Croce, contains the monumental tombs of Galileo, Michelangelo, Machiavelli, Dante and others. The two most famous art galleries, the Uffizi, the finest fine art museum in the world, and the Pitti Palace, the former Medici palace, which contains their art and treasures. A reawakening of your senses, is an over used cliche, but as we bike through the many medieval hilltop towns found in Tuscany the experience will certainly delight. First stop, Caprese di Michelangel, not only majestic in its naturalistic aspect, but rich in the history of art, as it is the birth place of the famous Renaissance artist, Michelangelo, whose influence on Western art is unparalleled. The scenic vineyards of the Chianti wine growing region beckon, leading to stunning Siena, and picture postcard, Le Crete, with rolling hills and rows of cypress trees. Siena is one of the largest Tuscan hill towns. You could spend the day exploring the winding streets which converge on the huge Pizza del Campo a UNESCO World Heritage Site. While most Italian cities have a church in their main square, Piazza del Campo instead has an exquisite medieval city hall, the tallest secular tower in Italy. Three hundred steps is all it takes, a just reward, for one of Italy’s finest views. Twice each summer for the last 300 years, the square is the center of a hair-raising horserace, three times around the square they go, trying to avoid collisions. If riding your bike is more to your liking then head southwards towards the heart of Tuscany, and enjoy the lazy rhythms of the world famous small towns, Moltanchino, Montepulichano and Pienza. Indulge in a typical, delicious inexpensive Tuscan lunch, Allementari, a plate of cold meats, cheese, tomatoes, gherkin, bread, water and the local rich, heady, and complex Chianti wine. A short ride from Siena, where we stop for morning coffee is Monteriggioni, a well known classical Italian walled town, conforming perfectly to the archetypal mental image most of us have of a walled town. Inside, there is almost no traffic, and the buildings are for the most part original, reinforced by fourteen massive square towers. Lunch, at San Gimignano, has a distinctive skyline, standing like a mirage on its hill top. It is an enchanting medieval walled town with impressive towers, a dreamlike setting, truly a little gem. It is so precious that UNESCO has declared it a World Heritage Site. A walk through the Old City gives you a taste of the town’s past, many narrow streets full of souvenir shops, restaurants, and the best ice cream shop in Italy. We must press on though, riding some of the most scenic roads in Tuscany, a quick stop at the hill town of Voltera, another famous medieval city, before heading on to the seaport of Livorno where we board the ferry to Sardinia. You will spend the night in a luxurious cabin. 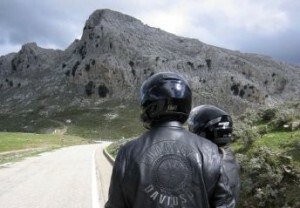 Welcome to Sardinia, one of the best motorcycle destinations in Europe. To start the day, breakfast is ordered in the finest hotel of the region, then we take to the roads, which are surely designed for bikers. We weave our way over fantastic twisty mountain roads with tight curves, through cork plantations, small villages along unspoiled beaches, with stunning views of gorges and valleys, and all mostly traffic free, makes for a truly joyous day, as we head to the small port of Cala Gonone. A chance to relax in Cala Gonone, perhaps to soak up the sun on a gorgeous gleaming white sandy beach, or, you could go for a ride. There are many exciting roads to discover on the island, some with sweeping curves, some twisting and challenging, to exhilarate your senses, or you could take a scenic ride and let the scenery unfold. Cliffs, beaches, the gorgeous blue sea, and part of the landscape too is the scattering of more than 7000 nuraghi, conical defensive stone towers; dating to Paleolithic times, no parallel exists anywhere else in the world. They are well worth exploring. Riding on the western side of Sardinia, there are many kilometers ahead, with turn after turn of tight twisties, and impressive views of gorges and rugged rocks as we ride through this mountainous interior. Sardinia does not have huge cities, but you will see beautiful towns, full of character and atmosphere, such as Orgosolo. Sicily is known for the Mafia in the town of Montelepre, Sardinia has its own version in the form of Orgosolo, a town which had at least one murder every two months between 1901 and 1950. Orgosolo is famous for its murals adorning the town, which became an expression of social discontent in the late 1960s, due to Italy’s then collapsing economy. This makes for a fascinating walking tour. We cannot linger though as the remoter parts of the island entice, such as Bosa,where startling brightly painted houses nestle in a wine growing valley close to the sea. 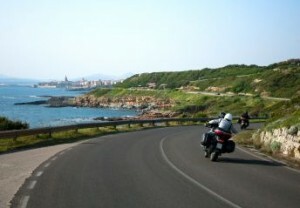 Finally we ride the scenic coastal road to the medieval walled city, Alghero,which makes a strong visual impression as you round the last twisty bend. 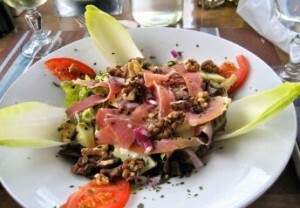 It is famous for its beautiful beaches and mouthwatering dishes influenced by its long Catalan history. Alghero is a bustling town with a thriving working harbor. To the north of the marina are fine sandy beaches, yet it is only a short stroll to the historic center, with its labyrinth of narrow lanes in which to lose ones self. Or you could enjoy a day on your bike, attacking more twisties just a few kilometers from the town. We must leave Sardinia behind and continue to Corsica Island, and one last medieval town to view, Castelsardo. A stiff walk to the fortress is necessary to admire the stupendous views of the bay and let your imagination wonder, as to how people lived there in medieval times. After lunch we follow the coastal road to the port of Santa Teresa, boarding a ferry to Corsica, a distance of just 12km. Sailing closer to Bonifacio, the appearance from the sea is of a white city gleaming in the sun, floating on turquoise waters. 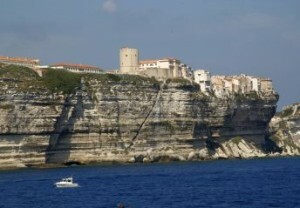 Our hotel is to be found in this ancient town, Bonifacio. A few hours before dinner we will explore the narrow streets and medieval houses teetering on the edge of the imposing limestone cliffs; some five or six stories high yet often just one room deep. They dominate the cliff top. Corsica is a mountainous French island, and again some of the world’s best motorbiking roads are to be found here. Your skills will be tested as we ride through this hilly area, do not gaze for long at the amazing views, for there will be many stops to enjoy them. We could not pass Napoleon Bonaparte’s birthplace without a stop at his ancestral home, Casa Buonaparte. Riding further north, we pass through the most scenic part of Corsica, Les Chalanche, where superb rock formations, and sea views, are in plentiful supply, before ending our riding day in the beautiful old town, Corte. Corte is spectacularly set amongst fiery red colored granite cliffs, carved into bizarre shapes by the force of wind and water. These multicolored spires look dazzling against its surrounding green foliage of pine and chestnut forests, and vertical cliffs that descend to the sea far below. A ride could be your preferred choice soaking up the views, you could follow one of the walking trails, or just chill in the hotel and wander the narrow streets. On our last day in Corsica, we ride to the most northerly part of the island, Cape Corse, before leaving for the mainland, a 4 hour ferry crossing back to Livorno. Then it is a short ride to Pisa to view one of the most remarkable architectural structures from medieval Europe, The Leaning Tower of Pisa. We will finish the day riding to the heavily fortressed town of Lucca. Almost perfectly preserved, Lucca emanates charm, showing layers of history on every corner of its narrow winding streets. One of Tuscany’s best-kept secrets. Back over the Apennine mountain range, to the home town of Ferarri’s factory, Maranello, for a tour of the famous Museum, followed by our last ride in beautiful Tuscany before returning to the beginning of our remarkable tour, Venice. Clutch Team will transfer you to the airport, or any other point in Venice from where you will continue your travels.